Architecture needs mechanisms that allow it to become connected to culture. It achieves this by continually capturing the forces that shape society as material to work with. Architecture's materiality is therefore a composite one, made up of visible forces (structural, functional, physical) as well as invisible forces (cultural, political, temporal). Architecture progresses through new concepts that connect with these forces, manifesting itself in new aesthetic compositions and affects. Ornament is the by-product of this process, through which architectural material is organized to transmit unique affects. This book is a graphic guide to ornaments in the twentieth century. 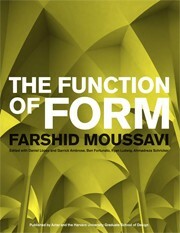 It unveils the function of ornament as the agent for specific affects, dismantling the idea that ornament is applied to buildings as a discrete or non-essential entity. 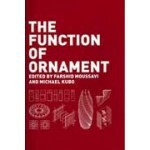 This book is a graphic guide to ornaments in the twentieth century. 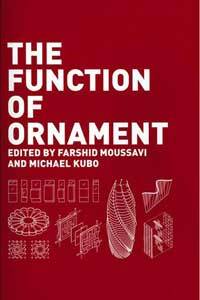 It unveils the function of ornament as the agent for specific affects, dismantling the idea that ornament is applied to buildings as a discrete or non-essential entity. Each case operates through greater or lesser depth to exploit specific synergies between the exterior and the interior, constructing an internal order between ornament and material. These internal orders produce expressions that are contemporary, yet whose affects are resilient in time.